Doing well on the job interview is crucial to getting the job, no matter how impressive your resume is. And an important aspect of doing well in interviews is proper preparation. 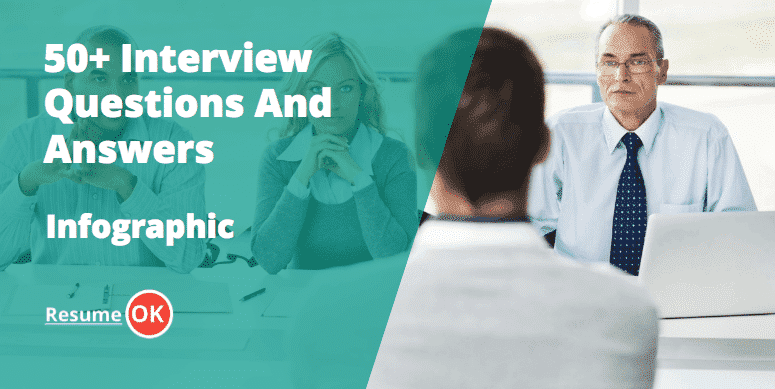 For the most part, many of the interviews will have the same common questions that might be phrased a little differently. So if you have an upcoming job interview, read over these 50 most-asked job interview questions and prepare for them as best as you can. 4) What Do You Know About this Organization? 6) Do You Prefer to Work in Teams or Alone? 8) If You Had Enough Money to Retire Right Now, Would You? 10) Have You Ever Had a Conflict With Someone at Work? How Did You Handle it? 11) Are You Applying for Other Jobs as Well? 12) What Has Been Your Biggest Accomplishment So Far? 13) What is Your Greatest Weakness? 14) What is Your Greatest Strength? 15) If You Knew Your Boss Was Unequivocally Wrong About Something, How Would You Handle it? 16) What Relevant Job Experience Can You Bring to This Organization? 17) Have You Ever Been Fired? 18) When Can You Start? 19) What are Your Salary Requirements? 20) How Long Do You Expect to be With Us? 21) How Well Do You Handle Pressure? 22) Where Do You See Yourself in Five Years? 23) What Did You Dislike About Your Previous Job? 24) What Did You Like About Your Previous Job? 25) Have You Ever Gotten Frustrated at Work? If So, What Did You Do? 26) What Are You Looking For in a Job? 27) How Do You Juggle Multiple Responsibilities? 28) What Are Your Expectations of a Supervisor? 29) Are You Willing to Relocate? 30) What Are You Passionate About? 31) Why Do You Want This Job? 32) How Do You Handle Criticism? 33) Can You Tell Us A Little Bit About Our Industry? 34) Tell Us About Your Last Position? 35) Have You Ever Held a Leadership Role? 36) Are You Overqualified for this Job? 37) What is Your Work Style? 38) Can You Give an Example of When You Have Successfully Worked as a Team to Accomplish Something? 39) How Long Do You Expect to Work with Us? 40) How Do You Handle Failure? 41) What Do You Find Most Rewarding About Your Previous Job? 42) What Do You Find Least Rewarding About Your Previous Job? 43) How Do You Measure Success? 44) Do You Have Good Relationships With Previous Supervisors? 45) Tell Us About a Time You’ve Made a Mistake? 46) Discuss Your Educational Background. 47) Would You Be Willing to Work More than 40 Hours a Week? 48) Why Are You Looking for a New Job? 49) What Do You Think Your References Would Say About You? 50) Do You Have Questions for Me? This is probably the most-asked interview question, next to “[d]o you have any questions for us?”. And there is a reason for that. The answer to this question really tells the employer a lot about you and what you are all about. In order to answer this job interview question effectively, you must be succinct, confident, but not overtly conceited. The answer should be longer than 1 minute but shorter than 3 minutes. Beyond a few minutes, you are just going to lose their attention. To answer this question, talk a little about where you grew up, your education, and any relevant work experience you have. Be sure to concentrate a lot of your time on your career. This is not a question for you to talk about your personality or character traits—but the interviewer should be able to get a good grasp of who you are from your answer to this question. This is a tricky question to answer; you don’t want to come off as a braggart but you also want to expound on the qualities that makes you better than other candidates. To answer this, do not focus on your GPA or what school you graduated from. Instead, focus on specific skillsets that makes you valuable, as well as specific accomplishments that makes you the best candidate for the job. Remember to cater your answer specifically to the job announcement. Do not ever bad-mouth your previous employer when answering this job interview question. It doesn’t matter if the previous employer really stuck it to you or not. Doing so is very unbecoming and unprofessional and can easily disqualify you from the job you are applying for. If you really did leave your previous job because you did not like your boss, you can simply state that you and the previous employer did not see eye to eye on certain aspects of the job. Be sure to have specific examples in mind. Another good answer to this question is to say that there was no room in the company to grow professionally and further your skills. You should also never say that the previous employer did not pay you enough—this will make the interviewer think that you are only in it for the money. Before going to the interview, always do your homework on the company, and if possible, the people interviewing you. The more in depth you can go into detail about the company, the more they will be impressed. To answer this question, you can go into when the company was formed, who the leaders are and what they have accomplished, and what specific customer segments the company caters to. For bonus points, you can talk about the company’s financials and/or projects that are in the pipeline. Do not say “because the salary is high[er].” You need to be really specific as to why you want to work for the company that doesn’t involve a higher salary. And if you are really applying for your dream job at your dream company, you can say that it has always been your dream to work with them since you were young. But be sure to explain why it has always been your dream. I find that my preference is really dependent upon whether I can turn in a better product alone or with a group of collaborators. And I find that more often than not, a group of adept coworkers is extremely helpful in a project that demands expertise in many different areas. This question is very much like the last question but you will have to answer “yes” to this question unequivocally. However, upon answer yes you will need to come up with a specific answer from your past that shows an example of how well you worked in a team environment and what you were able to accomplish together. I would continue to work because I have been working tirelessly since I got out of college and the work I do brings a lot of meaning to my life. I would continue to work because I want to continue to contribute to society. Having the money would be nice but the money doesn’t determine what I do with my life. The career I am in brings me happiness and I am going to keep doing what makes me happy regardless if I have enough money to retire or not. In answering this question, it is important to show that you are fair, level-headed, and civilized. In your reply, you should think of an example where you used your rational judgment and level-headedness to solve a personal conflict at work. This could be something as simple as a difference of opinion in how to approach a project to something as dramatic as handling workplace gossip. This is a tricky question to answer. Your first instinct is to lie and say that you are not applying for other jobs. However, the best way to approach this question is to simply tell the truth. As a matter of fact, potential employers are expecting you to be looking for multiple job opportunities. When telling them that you are applying for other jobs, you will need to reassure them that whatever job you get, you will put forth 100 percent to whichever company you end up working for; who you work for does not change your work ethic. And if the company you are interviewing for is your first preference, do tell them that. Refrain from answers such as “I work too hard” or “I have trouble leaving tasks unfinished.” These answers are too clichéd and you can bet that many of the people in the interviewing pool will answer the question with those answers. Your answer should be truthful yet memorable. Be honest about your weaknesses but also talk about what steps you have taken to improve upon those weaknesses. For instance, you can say that you are not a particularly adept public speaker. However, as an addendum to that answer, you can also say that you are taking steps towards be more comfortable on stage by going to Toastmasters meetings, volunteering for more speaking engagements, or even taking a public speaking class. Employers love employees who take the initiate to improve upon themselves. As an additional tip, it is best to choose a weakness that doesn’t particularly affect the job you are doing. In the example of public speaking above, you can use it for jobs that do not involve speaking in public. However, if the primary purpose of the job you are applying for is to speak in public, then you have pretty much all but disqualified yourself from the job if you answer the interview question with that answer. This interview question will usually go along with the question above. Answer with a positive trait of yours and give a specific example of how that strength was showcased in a work setting. Like the question above, you should pick a strength that can be adapted to the job. For instance, if you are an tax accountant, then being “detailed and thorough” may be a strength that want to talk about. This question gauges your interpersonal skills and how you deal with people in positions of power. In your answer, you should identify that the way you would handle such a situation would be wholly dependent on the personality of your supervisor, as different personalities respond differently to critique. Illustrate your point with examples. This should be a pretty straight-forward question to answer. If you have relevant experience, detail specifically what kind of experience you have. If you do not have any relevant experience, talk about tertiary job experience you may have that can be exported to this position. If you have no relevant experience at all, talk about how fast you learn and how hard you work. For most of us, this is an easy question to answer. However, if you one of the few that have been fired from a job, especially a full-time job, it is best to be honest about it. Companies have gotten quite good at digging up your employment history. If you were fired for a legitimate reason, tell them why you were fired and what lessons you have learned from it. If it was a long time ago, talk about your most relevant work experience and how well you have done since being fired. If the firing was unjustified, you may have to be a little careful in how you respond. You don’t want to completely bad-mouth your previous employer but you also want to illustrate the core issues that led to you being fired. This is a pretty typical question at the closing of many job interviews. If you currently have a job, make sure to leave enough time to give a two weeks’ notice. Your potential employer, as well as your present employer, will appreciate the decorum. The rule of thumb is to avoid talking about money during the interview. But if the interviewer asks, you should be able to come up with a concise number. If the job announcement has a non-negotiable starting salary, go with that. If the announcement has a range, you should pick a salary figure that is commensurate with your experience and skill level. It is important not to undervalue yourself but it is also important to not ask for too much too soon. Employers want to retain their employees for as long as feasibly possible. As such, you need to assure the prospective company that you are going to stay put if you are hired. One way to answer this question is to say that you are looking for long-term and stable employment in a company that has opportunities for career growth. The answer shows that you are looking to make a long-term contribution to the company but also striving for career growth. Being able to handle pressure is an indispensable tool in life. Employers want someone that can handle deadlines and difficult demands. So the only way to answer this question is to say that you handle pressure especially well. Of course, you will need to give an example of a situation in which you thrived under pressure. This question is used to gauge your mid-term goals and see if you are going to stick around if they hire you. You don’t want to say that you see yourself working for another company in five years. The best answer to this question is to say that you hope that you will still be with the company but in a role with more responsibilities. It’s okay to not like all aspects of your job. But do not use this as an opportunity to get on the soap box and rant about how much you disliked your last job. Instead, pick one thing that you did not like and extrapolate on it. Do not talk about something that is the core foundation of your job function. For instance, if you are an accountant, you can’t really say you hated the number crunching aspect of your job and wished things were more automated. To answer this question, pick something about the way your work or organization was structured. For instance, you can say that your previous employer was extremely inefficient in the way work was assigned. In this question, you are free to express what things you really liked about your previous job. Do not be afraid to talk passionately about the things you loved. Passion radiates and gives off good vibes. Everyone gets frustrated at work so it is okay for you to say that work has frustrated you at times. But the key is to show your potential employer that you are able to handle your frustration in a constructive manner. A good way to answer this question is to say that you stepped out for a little break to gather your thoughts and talked about what frustrated you once you are no longer emotional and are able to put things in perspective. When answering this question, do not come off as high maintenance. What you look for in a job shouldn’t be much more than a safe, respectful, and comfortable workplace and a job that is fun, challenging, and allows you to grow professionally (and personally). This question is used to measure multi-tasking abilities. Granted, multi-tasking is not the most efficient way of doing things but it is a required skill in today’s fast-paced work environment. To answer this question, you must show the interviewer that you are able to prioritize what the most important tasks are. You should also mention that you do not ever compromise quality when handling multiple priorities at once. I think a supervisor should have an open line of communication with their employees and be someone that their employees can approach with new ideas and insights about work-related matters. I think a supervisor should be fair in judging the performance of all employees. In addition, I think the supervisor should have some inherent trust in his or her team and vice versa. Most rank-and-file jobs will not require you to relocate. However, if you go into management, there may be a chance that you will be required to. Whether the job involves a possible chance of relocation or not will usually be on the job announcement itself. So when asked this question, it is important to not completely rule out relocation. You can say that you are willing to relocate under circumstances or give a flat out “yes” to the answer. It would not be wise to say “no” to this question, even if you are in fact unwilling to relocate. Chances are that you will not relocate if relocation was not made clear on the job announcement. You can use this question to showcase what is important in your life and what you value most. Your passion does not have to be work-related. It is okay to take some time to think about it but you should never say “I don’t have a passion.” You can say something as general as being passionate about your family and loved ones. This question gives you the perfect opportunity to showcase how much you know about the industry, the company, and its competitors. The ideal answer to this question should incorporate specific reasons why you want to work for this company, such as your excitement for its product lines or their unique positioning in the industry. This behavioral interview question is designed to find out more about your interpersonal skills. People who are easily offended are harder to work with so companies generally like to pick someone who can respond well to constructive criticism or opposing viewpoints. In your answer, be sure to illustrate that you know that no one is perfect and that you can respond positively to constructive criticism by taking steps to improve upon your weakness if the criticism is warranted. You will thoroughly impress your interviewer if you are able to nail address this question with specifics. The more specific knowledge you can share about the industry, the more likely you are to get hired. It is good to talk about the industry’s past and present, but it is great if you are able to talk about the industry’s future and project where it is going. Not many applicants will take the time to learn about the industry at this level. So if you are able to effectively answer this question with specifics, interviewers will be impressed by the amount of effort you have put into your research and preparation. When talking about your last position, talk about specific duties and responsibilities that you were tasked with. And when replying to this question, be sure to also briefly mention any accolades you may have been bestowed as a result of your work. A leadership role doesn’t have to mean a supervisory role. If you have ever been put in charge of a project, make sure to mention it and talk about how you handle the role. Even if you trained someone to do their job, that counts as leadership. In this economy, the position you are applying for may very well be something you are in fact overly qualified for. However, that does not mean you have to admit that you are overqualified. Instead, you should state that there is always more to learn, even if your previous work experience and education gives you a huge edge over other candidates. Additionally, you should clearly state that your prior experience and education has no bearing on your quality of work. If anything, your qualifications will be of benefit to the company as they will not have to spend as much money and time catching you up on things. In addition, you should also reassure them that you are there to stay and work your way up instead of applying for other jobs with other companies that are more in line with your qualifications. Knowing how to work with others is extremely important the workplace. To answer this question, talk about the specific project you tackled, the role you had in the project, and how the project turned out. Be sure to highlight any accolades or milestones you and the team achieved as a result of working together. I like stability. As such I would love to stay with your company as long as there is an opportunity for me to grow and make a difference. I don’t plan on getting another job unless the company’s ethical standards no longer align with mine. However, I do not see that happening as I have only applied to companies whose mission statements run parallel with my beliefs. Working for your company has long been a goal of mine for a long time. And as such, I don’t see myself working for anyone else if I am hired and the company allows me room to grow professionally and personally. How a person handles failures and bumps along the road says a lot about them. You are resilient if you are able to bounce back from failure and succeed. In answering this question, think of an instance in which you failed for the first time but did not let the failure deter you from accomplishing the task at hand. Your answer should show your resiliency and grit. This is similar to the question of what you liked most about your previous job. However, the question of what is rewarding is purely metaphysical. When answering this question, you should pick a core function of your job that you thought was rewarding. For instance, if you were a computer engineer that designed a prototype for a social networking platform, you can say that the most rewarding thing about your previous job was that you got to pioneer and be part of creating something that would revolutionize the way people interact on an everyday basis. This question is a bit trickier to answer than the previous one. You want to be careful not to say something that is a core function and responsibility of your job. When answering this question, be sure to be brief as you do not want to be seen as someone who dwells too much on the negatives. At a professional level, success means that I am working with people who are passionate about the work they do and love coming to work every day. At a personal level, success means that I am able to provide my family with a comfortable lifestyle so that they never have to worry about money. Professional success means that I love my work and the work I do is something that I would not trade for anything. Very few people go through life loving their work. I want to be one of those few. Success to me means that I would have accomplished all the goals I set out to accomplish as a child. I wanted to be a doctor as a child and now I am applying for your hospital, one of the most prestigious hospitals in the world. I would say that I am on the road to success. A company wants someone with good interpersonal skills. Your ability to get along well with higher-ups is an important consideration in how well you will do with the company. With that said, it is completely okay to not get along with one of your previous bosses. After all, you can’t get along with everyone. However, it is problematic if you have a sour relationship with almost all of your previous supervisors. When answering this question, be sure to accentuate how good of the relationship was with your previous bosses; if you the relationship extended outside of work and you still keep in regular contact with any of them, be sure to briefly mention that. It’s not a question of whether you’ve made a mistake, it’s a question of when. It is okay and natural to make mistakes. After all, no one is perfect. When answering this question, be sure to mention a mistake that is not too big. Mentioning a mistake that affects an organization’s bottom line can dissuade the interviewer from hiring you. Pick a mistake that is not too small but did not affect the bottom line of your previous employer. This question gives you a chance to chronicle your college experience and why you chose your degree/major. It is especially important that portray purposeful choices. Do not say that you picked your major because you could not get into the department you wanted or that you picked the major because it was easy. Instead, try to explain why the major was ideal for you, your personality, and your goals. Although employers are more respectful of a work-life balance than in the past, they still like someone who can go above and beyond what is required. Your answer to this question should always be a resounding yes. The previous company was a rather small company that lacked the growth potential I was looking for. The previous company did not allow me to grow beyond my current position. The previous company and I disagreed on a lot of moral/ethical issues and I finally decided that it was time for me to part ways. I think my previous employer would say that I am an extremely hard worker who always turned in a quality product. In my time with him, I have never missed a deadline and have never had a client complain about my work. I think my previous employer would say that I am extremely creative as many of my mockups were chosen as designs for many clients. I think my previous employer would say that I am an extremely efficient and creative engineer as the software I programmed have always required the fewest lines of code and had the fewest debug errors. Is the company looking to introduce any new products into the market in the coming years? Will there be opportunities for employees to attend training or continuing education classes to improve skills that relate to the job? What are the company’s expectations of me within the first month of working? How is the organization set up? How big is the team I will be working with? Will there be opportunities for me to take on leadership roles in the near future if I am hired? How does the company measure and gauge the output of its employees? Have you been asked other questions? Please write in the comments below. job search. I am very grateful for your help. Goodbye. We are glad we could help. If you’ve been asked other questions that we haven’t mentioned, please let us know. You di a very good job.Good luck with your career and your life. Went on a couple of interviews in the last month and these are basically the exact questions I was asked. Thanks for the help. Interview question that has stumped me in the past: Tell me about a recent problem you experienced and how you resolved it. I have so many; how do I choose? Very interesting post. I am currently in a moment in my life where I’m trying to work for my dreams instead of in my backup plan.